For Tissot’s friend Édouard Manet, 1869 started badly with the government forbidding the exhibition of his new painting, The Execution of Emperor Maximilian. Archduke Ferdinand Maximilian (1832 – 1867), the idealistic younger brother of the Austrian Emperor Franz Joseph, had been installed in power in Mexico in 1864 by French Emperor Napoléon III as a means of recovering huge debts and of interfering with the United States during its Civil War. 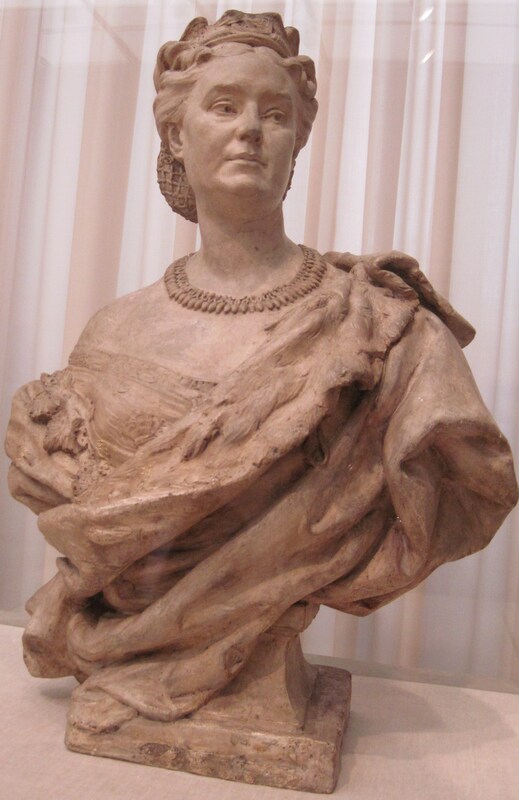 Three years later, Napoléon withdrew French military support for the puppet emperor, and Maximilian and two of his generals were captured by Mexican loyalists. 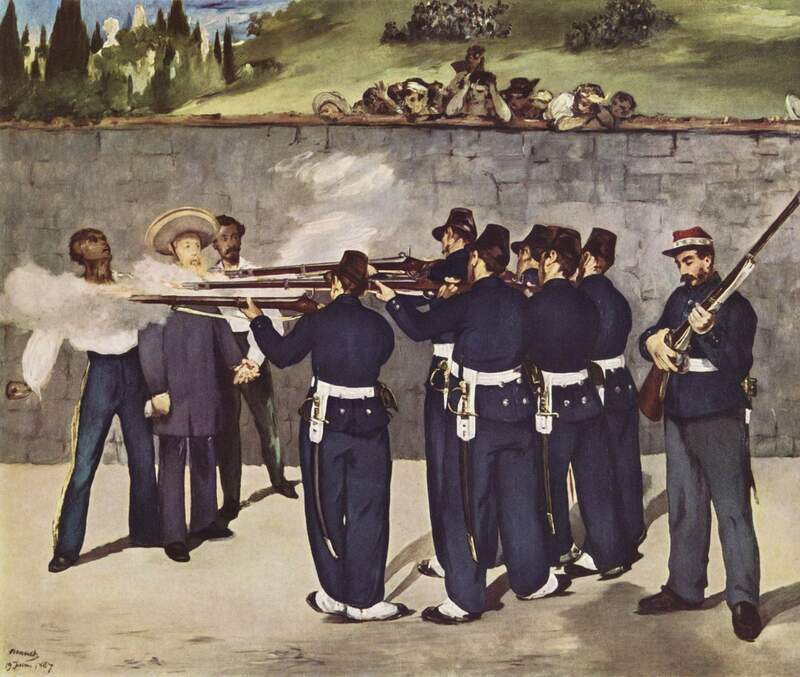 They were executed by firing squad on June 19, 1867 under the orders of the Mexican president who had been displaced when the French took control. When the news reached Paris, Manet, an ardent republican, went to work, first using an eight and a half foot wide canvas, and then restarting on another over nine feet wide before ending with a new one ten feet wide, to portray the outrage that shocked the French. 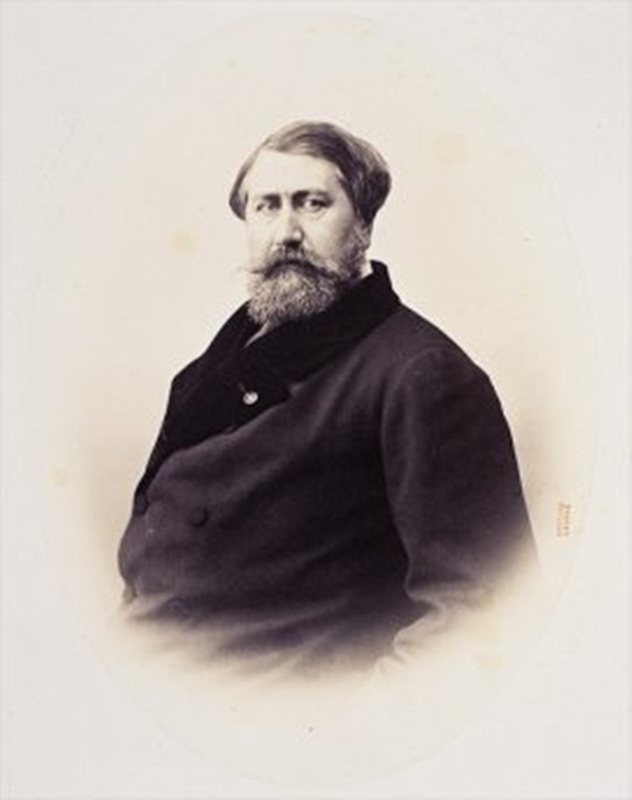 He painted the Mexican soldiers in French uniforms and depicted the executioner in a goatee resembling the one worn by Napoléon III. Manet also prepared a lithographic version of the scene which could be reproduced and sold to the public as prints. But in January, the government denied permission for the lithograph to be printed, and his incendiary painting was not allowed at the Salon in 1869. In 1869, Courbet exhibited three paintings at the Salon which he had already shown at his pavilion near the 1867 Paris Exposition: Siesta, the Hallali and Mountains of the Doubs. The young painter Frédéric Bazille (1841 – 1870) wrote that Courbet’s paintings were like masterpieces among universal dullness. But financial misfortunes seemed to dog Courbet; an art dealer who owed Courbet 30,000 francs went bankrupt. “I really have no luck,” Courbet wrote. 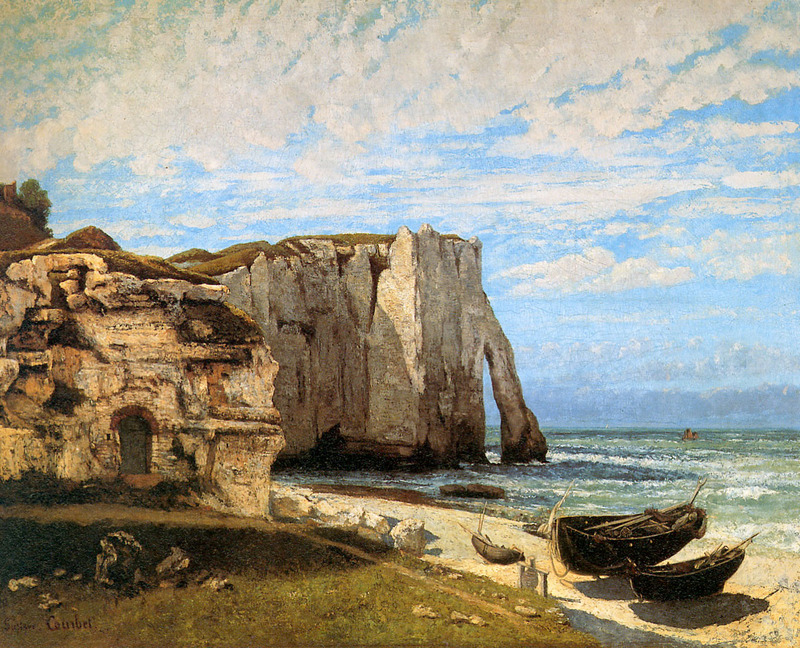 In mid-August, Courbet was at Etretat, in northern France, sea-bathing and painting. In a vast, empty room, a fat, dirty, greasy man was slapping dollops of white paint on a blank canvas with a kitchen knife. From time to time he would press his face against the window and look out at the storm. The breakers came so close that they seemed to batter the house and completely envelop it in foam and the roar of the sea. The salty water hammered the panes like hail and ran down the walls. This work became ‘The Wave’ and caused a public sensation. He would live up to that slogan within the next two years. This entry was posted in Art blog, Art History, Impressionists and tagged Édouard Manet, Comte de Nieuwerkerke, Empress Eugénie, Gustave Courbet, Napolean III, Princess Mathilde Bonaparte, The Execution of Emperor Maximilian on January 9, 2013 by Lucy Paquette, author of The Hammock: A novel based on the true story of French painter James Tissot.